Next to anecdotes of Shanghai residents no longer carrying wallets or bank cards to pay for transactions, perhaps the most intriguing sign yet of the cashless revolution sweeping China is the report of Chinese beggars using mobile payments and QR (quick response) codes instead of asking for spare change. Though it turns out that the beggars were making money not from alms but from local companies who paid for each mobile phone scan of a sponsored QR code—it was essentially a way to gather data to be used for marketing—the report nonetheless underscored the rapid rise of mobile and other digital payments in China. According to research portal Statista.com, China leads the world in digital payments, with a total transaction value estimated to grow 27 percent to $1.04 trillion in 2018 compared to only $927.1 billion in the United States, $198.4 billion in the United Kingdom, $160.7 billion in Japan and $121.6 billion in Germany. Though only half of the Chinese population of 1.4 billion have smartphones (compared to around 70 percent of the 327 million people in the US), easily 37 percent of the Chinese use mobile payments against only 15 percent in America, according to the 2018 China Internet Report of the South China Morning Post and 500 Startups. More importantly, the spread of e-commerce and mobile payments in the Chinese countryside has helped spur entrepreneurship and job creation in over 2,000 poor villages. As of 2017, there were already 490,000 active online shops in these villages, generating sales of $19 billion and creating 1.3 million new jobs, according to the 2018 China Internet Report. In each of these villages, about a tenth of households sell goods online and generate sales of at least $1.6 million. Keen to spur a similar e-commerce and digital payments revolution in the Philippines, where 86 percent of the population are unbanked, the Duterte administration is looking to learn from China’s experience. In February, Philippine officials led by Finance Secretary Carlos Dominguez III spent several days at the Alibaba Business School in Hangzhou, China learning how the Chinese e-commerce giant and its fintech arm, Ant Financial, partnered with the Chinese government to provide financial services at low cost to rural-based entrepreneurs. To look more deeply into the Chinese experience and examine what lessons can be drawn from it, the Asia Pacific Pathways to Progress Foundation (APPPF), an NGO composed of international studies scholars, and the University of the Philippines Institute for Small-Scale Industries (UP-ISSI), a research and training unit for small business owners, will hold a forum entitled “China’s Financial Technology and E-Commerce Experience: Exploring Implications for the Philippines.” It will be held on August 9, 1 to 4 pm, at the UP’s new campus in Bonifacio Global City in Taguig City. Entrepreneur Philippines is a media partner of the event. (1) Since China is a developing country like the Philippines, how can the latter learn from the former’s e-commerce entrepreneurship, especially in rural and village households? (2) How can the Chinese model of fintech and e-commerce promote a more inclusive economic growth and business model in the Philippines? 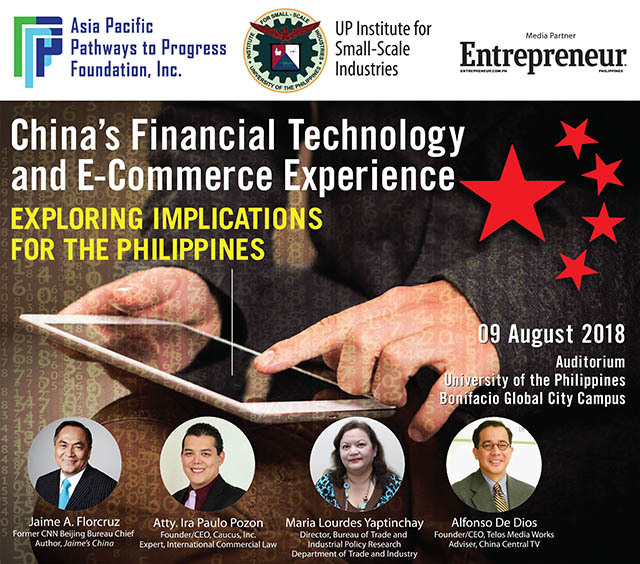 (3) Fintech and e-commerce have already gained momentum in the Philippines but are still not as advanced as China’s. What are the challenges, obstacles, and areas for improvement? (4) In connection with our foreign economic relations, how can the Philippine and Chinese economies be further integrated by cross-border e-commerce? Leading the speakers at the forum is Jaime A. Florcruz, a long-time Filipino resident in China, former CNN Beijing bureau chief and author of Jaime’s China. He is joined by Atty. Ira Paulo Pozon, an expert on international commercial law and founder and CEO of Caucus Inc.; Maria Lourdes Yaptinchay, director of the Bureau of Trade and Industrial Policy Research at the Department of Trade and Industry; and Alfonso De Dios, founder and CEO of Telos Media Works and adviser of China Central TV. Interested participants are required to register. Click here for more information.